1 - Arm yourself with good weapons and protect yourself with good equipement. 2 - Have a vehicle to transport yourself. 3 - Learn how to take care of zombies and techniques to avoid then. 4 - Know the safe and not safe areas of the map (due to missions, or enemy bases). 5 - Construct a base. 6 - Grow your base. 7 - Stock vehicles and armed vehicles (car, tank, APC, heli, plane/jet, boat, drone). 10 - Steal vehicles, items and money from other players or bases. 12.3 - Guarded Military Areas. 12.7.1 - Fort of Light. 12.9 - Fort Defend: fight against a horde of enemyes and zombies. 12 - Help other players. 13 - Fight bad players. 14 - Defend your base. What you have in BRPVP to help you in these goals? 1 - Traders to buy Items and construction pieces. 2 - Shops to buy vehicles. 3.1 - Master key to open locked vehicles. 3.2 - Master key to open inacessible base doors. 3.3 - Master key to open enemy loot boxes. 3.4 - Tool to hack players bank account. 3.5 - Service to search and spot enemy players. 4 - Fedidex Services: cheap, on demand, items and temporary vehicles to help you in bad times. 5 - Money rewards for killing zombies, killing armed enemyes and destroying convoys. 6 - Items and money rewards in all BRPVP threats/missions, especially Super Missions. 7 - If you make friends, they can help you. 8 - Abandoned vehicles on Altis, you can use then until server restarts and cal sell then. 9 - Virtual Garage, a place to store some vehicles (amount limited). 10 - Information of the ofensives you take, like base invasion, to allow you to hit back the right persons. 11 - Base radar to detect base invasion iminence. 12 - Loot inside houses. 13 - Collectors to buy items you find on Altis world, earn doing missions or steals from other players. 14 - Dismantle areas where you sell vehicles. 15 - Turrets operated by robots to defend your base, even when you is offline. BRPVP saves everything in MySQL. BRPVP don't make use o any mod and it's not a mod (but sounds like a mod). BRPVP is a mission, so it don't require any extra download on player side. BRPVP is made of 122 new sounds, 185 new images and 35000 lines of code. Assets are all from Arma 3 and DLCs. BRPVP have configuration variables you can change to your tastes. Base invasion, it lasted for more than 2 hours. Some disabled defence turrets. A Event done in my server. At date of write, 2 servers in Russia, one in France and one in Brazil. Fixed balaclava disappears when player dies. Fixed player getting stuck in mission turrets. Position precision of constructions saved on database increased 100 times. Jets and heavy tanks removed from traders. Vehicle menu on vehicle traders now show armor and storage capacity. Sky dive and parachute works allways the player is falling above 100 meters. Respawn wait time is larger when you die for a player. 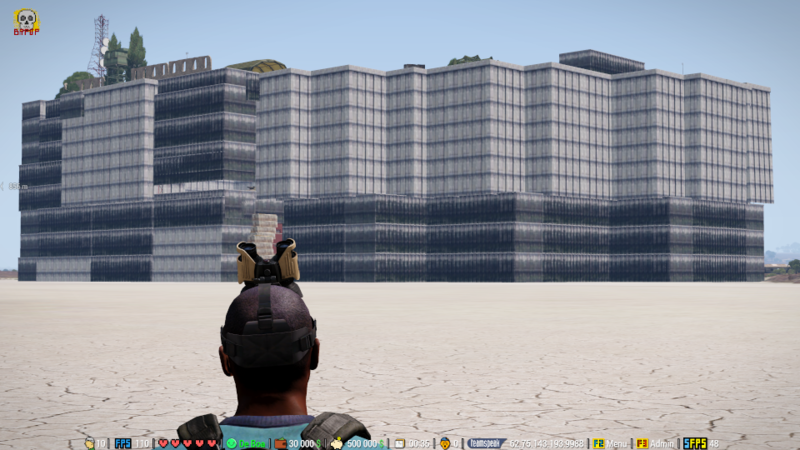 Added guards defending the Altis wall passages. Time penault to respawn in PVP areas are allways 20 seconds. You can't use master keys in the Traveling Aid areas. The flag wall now goes into water if the flag is near water. Added Control Center to quickly change the share of all your base goodies. Added smart remote control to open doors https://youtu.be/Wa7j2CcPUME. Fixed kill zombies with vehicle weapons don't give money. Now you need to have free space in front of you to open the personal vault. The remote control fix bugged doors when they are out of sync. You can put all vehicle in virtual garage, but limited to a number of each type. Payer disabled and player killed messages are put in MySQL tables now. New EV mission: Fear Refinery. Vehicles caught from Virtual Garage can be put again in it only after 15 minutes. Fixed player dynamic 3D marks stuck or not show. Player dynamic 3D marks are now visible to squad group and on map. Now you can add a wall (5 types) arround flag area with 1 to 4 entrances. Door hack on big buildings affects all doors near the hack position but not far doors. Admins now can choose between player mode and admin mode on login. You cannot pass your flag to another player if he already have a flag. Added Identifier item that allow you to identify the owner of a object, flag or vehicle. Added new mission: Bomb Mission. Added option to see avaliable slots in virtual garage. Added slightly modified Infected Village (100 zombies by default). Infected Village zombies allways appears on map as orange dots. Added a new mission: Transport Mission. Dead turrets can't be removed giving space to another turret. Only after server restart. Hacked buildings and objects now stays fully acessible until server restart. Another try to avoid some spawned vehicles on traders to explode. Fixed base defense turrets sometimes stops to attack after player dies to it. 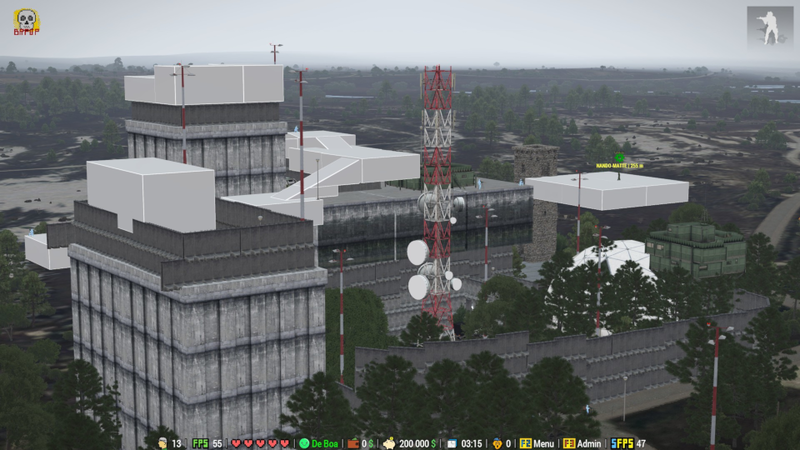 Base radars are more usefull now (it see more). Created "No Item Loss" mode where players don't loose gear when die, mainly for events. Fixed player loose vault itens when BRPVP try to save a closed vault. Land vehicles and players inside land vehicles now don't receive collision damage. When you put a vehicle in the virtual garage, money is taken from the bank, and not hand anymore. Added ban and unban options on admin menu (not BE). Added "Who Invaded my Base" option on player menu. Leaving a vehicle near a building don't make you enter the building. Event Handlers now run a function and not code, for better performance. New boat trader in the north of Altis. New EV mission (Super Mission): Fear Refinery. You can now set view distances for ground and flying modes. 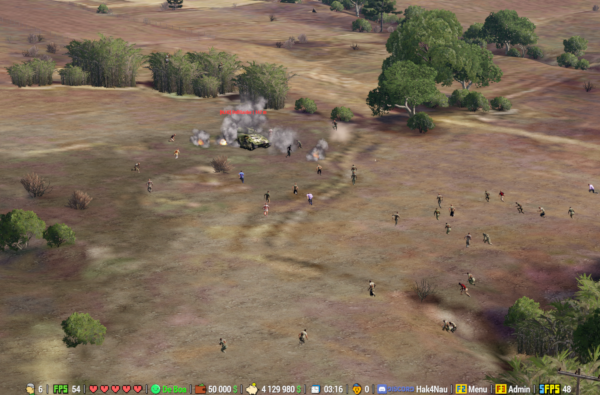 AI vehicles are fully refueled each 5 minutes. V038A - Fixed players access admin menu using View Distance option. Jump in closed areas is less buggy now. PhysX objects do not fall slowlly when constructing in the air. When constructing you can move objects near and far with keys G and T.
When a EV mission finish, it removes itself and another EV mission starts. Jets prices cut down to 50%. IDAP and Gendarmerie uniforms now can be sold in the Collectors. Enemy spawn on Fort Defend is now covered with dust smoke to allow spawn on open areas. Tweaked small missions loot and reward to make then competitive with EV missions. You cant automatic transfer money flares from a box. Error in kill messages fixed. Bank account is now limited to 15 milions. You can store 4 milions in each base storage box. Added Hack Tool on obscure trader, with it you can hack a player bank account. Increased the value of flares to allow storage of greater money with less flares. You can apply the dir and z attributes of other objects to your constructing object. You can't transport money flares but you can transform then in wallet money. Added IDAP Van to vehicle traders and Fedidex Express Service. Added artillery vehicles to traders with limited attack ranges. Fixed a bug in jump. Result: no more stuck when over no-walk objects. Translated construction keys reference to english and russian (thanks zhaleks). Fixed unstopable rotor sounds sometimes when you leave a heli. Added drones, you can put then in the virtual garage anywere on the map. Fixed vehicles exploding when you buy it. Fixed disabled player not trow money suit case when disconnect. Try to fix uniform and vest not saving on database. Fixed virtual garage spawn when player is above a ground object. Fort Defend mission. Defend the fort against waves of zombies and AI units, win money and items. You can use spoting services to spot a player. This service is acquired in the Obscure Traders. You now can use jump to unstuck yourself when stuck-floating above a geometry (vehicles, walls, etc). The extra jump velocity done by surround geometry is now limited to 2 m/s. The excedent of items tranference action is now put on the foot of the player executing the action. Code optimizations to reduce the number of opened subscripts with small duration. The small Tanoan hangar now can be lock picked. Tweaked code to avoid buildings doors out of sync in different players machines. The rewards on Fort Defend mission now goes to player wallet and not the player bank account. You can construct a item that clean the trees and bushes 50 meters arround it. You can place a shovel near a tree to remove that tree. You can add trees to your base with the construction kit trees. Radioactive areas with valuable loot. Use vodka to attenuate radiation effects. Fixed weapon dissapear when player is revived (Arma 3 1.84 BRPVP bug). Fixed loss of weapon acessories when transfering items from cargo to cargo. Added a variable to turn AI blocked loot on and off easily (off by default). Added a fix for isPlayer Arma 3 function giving false negatives. Added Event Missions (EV) that you can turn on and off anytime. Fort of Light is now an Event Mission (EV). You can manualy set the box used in the player personal vault. For the ones wanting a bigger box. Each event now have 2 reinforcements, a Kajman Attack Heli and a Huron with soldiers. Fixed bipods and binoculars dissapearing when saving items to database or transfering items. Denied items are automaticaly removed from mission loot and dead AI units. If you die equiped with a denied item it will be deleted and a sound will play. Fixed unable to turn off base lamps. Added virtual garage to all airports where you can store your planes, you must pay to use it. Buildings now have global simulation disabled. Simulation is enabled when needed. You can add Camonet and SLAT armour to the APCs and Tanks. Now the vehicles that spawn on map are Fedidex vehicles, they get deleted on restart. New oportunities to have vehicles simulation turned off. Fixed dupe related to personal vault and sell receptacle. Fixed a dupe related to item transference. Added no build area around EV events. Added option "See Buildable Area" to show on map where you can build a flag. Added turrets to EV event mission in Tanoa. Spot error increased to 500 m and now the spot money goes to the spoted player. Kill message now show the projectile used, not the weapon. Fixed various bugs that happens when you die with the vault or sell receptacle open. Thank you very much BRPVP ! It's very good to see new stuff coming up ! Congratulations for the release . I have 1/4 of an eye in DayZ Standalone... just gaining forces to learn something new, and more challenger than normal because i'm no programmer. The language i somewhat mastered, SQF, is not present in DayZ SA. For me SQF is pure pleasure. I will stick in BRPVP the most i can. Right now i have in BRPVP plent of features ready. 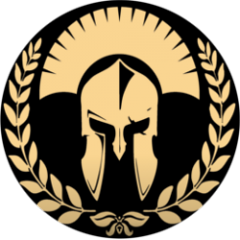 I'm out of new ideas, actual server admins are satisfied, and what i seek is players or server owners that want to promote a BRPVP server and seek players. The most i can get on that, have players, the most i will stick in BRPVP. I will try to make a small movie to show the feel of BRPVP, and may be bring some more interest. It's good to hear this and i really like the creative persons ! The Kill Board show all Kills on the server at the time it happens. The link above is the kill board of my server. Now you can add a wall around your flag area for 5 milions. You can choose from 5 wall types and from 1 to 4 entrances. You also can select if the wall will follow the terrain or not. Those walls are created as simple objects. In BRPVP bases people uses many gates is sequence, one after the other, or one inside the other, because this makes base invasion more hard. The invader needs to hack all the gates to enter. One problem that comes from that is the tedious task that is to open and close all the gates of your base when you want to move in it, leave or enters it. BRPVP have many more things for you to do than Exile, it's far more complete and rich. It's completely free and it's just a mission. Create a server and bring players to it, I just ask for having "BRPVP" in server name (a must). Try it, tons of hours was put in good programing and lots of features! It's a shame we don't have tons of players, quality is all you need, so play BRPVP now! Remake of admin fly mode (now keys 4, 5, 6 and 7). A base inside a base. I use your server. I want to ask some questions. I like this very much, but I want to improve something. My English is very rubbish. I hope to understand it. 2: Server automatic restart is too frequent, once the automatic restart will prompt the task to complete, unable to continue the game, need to restart manually. 3: I want to join you, but I don't know what you want. 4: AI tasks in the game cannot be automatically refreshed. It needs to restart the server to refresh. 6: Do you have any contact information? Talking in forums is too slow. It can't solve the problem quickly. Finally, thank you very much for doing so well. "1: There are only four people in the team at most. I don't know where to modify it. I hope you can tell me.)" "2: Server automatic restart is too frequent, once the automatic restart will prompt the task to complete, unable to continue the game, need to restart manually." "3: I want to join you, but I don't know what you want." You have a public server? How much players? You can add me in Discord so we can chat about new features and changes. "4: AI tasks in the game cannot be automatically refreshed. It needs to restart the server to refresh." What AI missions are you talking about? Most of then restarts after finish. "5: I'm not sure if it's the end of PVP. If so, why can I keep calling? (I'm using this now to end, my model is PVP)"
You mean BRPVP should be BRPVE? "6: Do you have any contact information? Talking in forums is too slow. It can't solve the problem quickly." Visit www.brpvp.com and get my contacts, you will find my Discord name & code there. I need your permission to add your friends. My server is new, and there are only about 20 people at present. Looks pretty wicked 👍 What is involved to port to another terrain? What to port to WW2 setting? Looks pretty wicke﻿d﻿﻿﻿﻿﻿ 👍 What is involved to port to another terrain? What to port to WW2 setting? 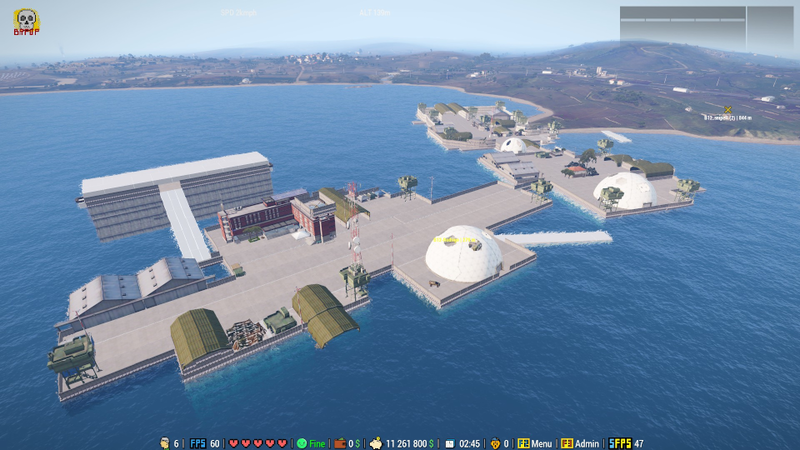 To port most of the things you just need to fill arrays with new positions, but some of the missions have custom constructions that are tailored for Altis. For a WW2 version it's some more work, but not impossible. There is a Chinese BRPVP server doing very well. It do not appears in normal searchs because names are in chinese characters. Where can i find WW2 stuff? Can you indicate the mods i need to use? Chinese server. My FPS is caped at 30.